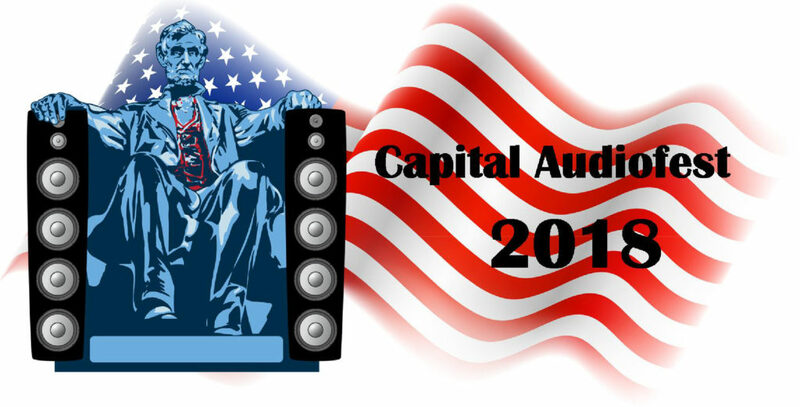 Neli will be at Capital Audio Fest November 2 – 4 [I am unfortunately otherwise occupied]. 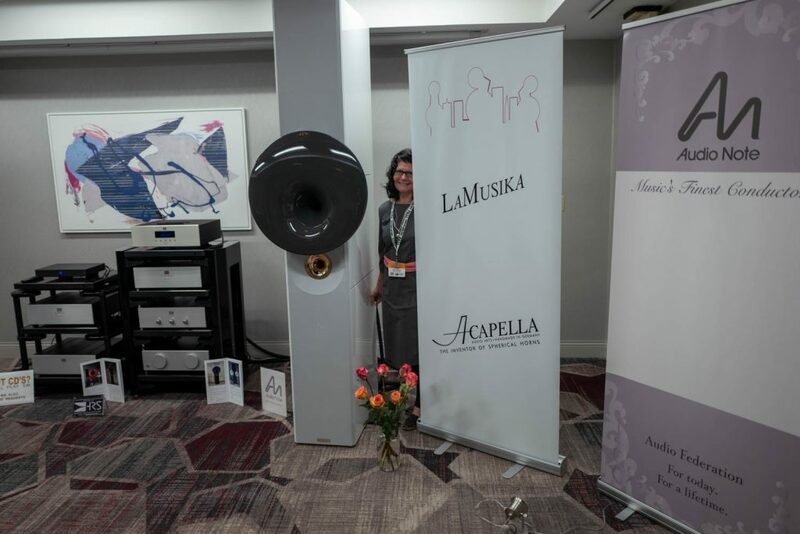 She will be alternating between the Old Forge Studio room featuring the Acapella Audio Art “La Campanella” loudspeakers and the Triangle Art room. 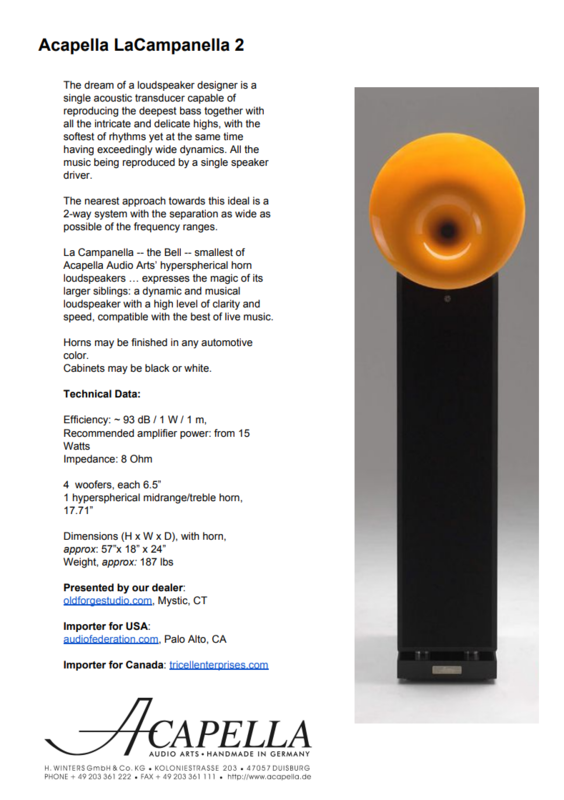 These last few months with the Acapella Atlas speakers have been quite different from what we have been used to. 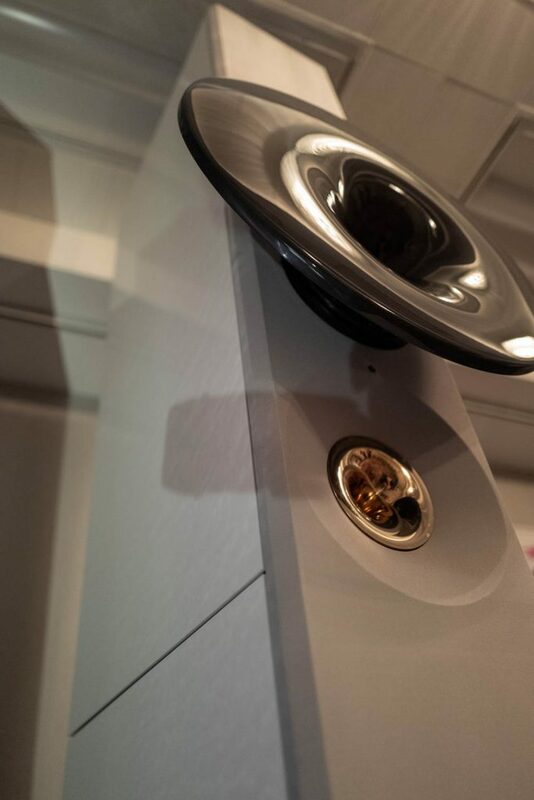 Easy open dynamic sound with modest resolution versus what we had previously: over-the-top resolution with modest dynamics [we were only able to get world class dynamics when pairing the Audio Note Gaku-On amp and Nordost Odin cable with the Coltrane Supreme speakers. And I mean this was real dynamics, not the typical artificial dynamics of solid-state]. So we listened and listened to the Atlas. Yeah, it was quite nice. 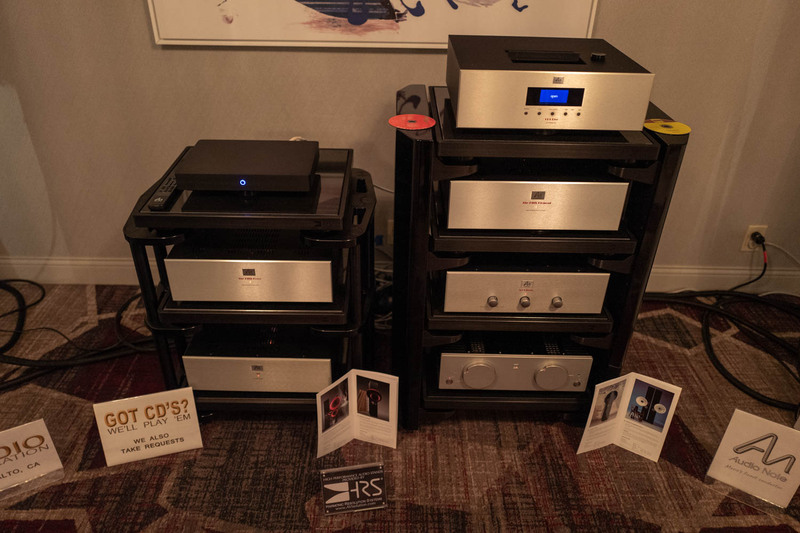 With the Acapella Atlas being about 1/4 the price at only the relatively modest, if not measly, $100K we certainly didn’t expect it to sound *better*. But this weird thing happened that has confused the issue some. For me anyway. While Kevin was here a week or so ago, we decided to nudge the speakers around a bit. We wanted to try and see if we could position them better. 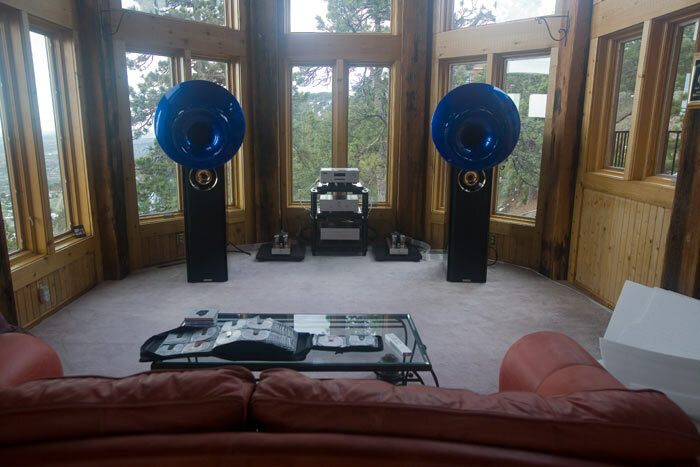 A word about our somewhat infamous 24 foot tall listening room that looks out on the Boulder / Denver metropolis. Our house was built in 1975. In Boulder. With this fantastic view. Boulder. The mid 70s? The point being that one just can’t measure distances from the listener or the walls and make things [sound waves] all sync up nicely. So speaker setup is much more of an art, and would probably take a bit more of that pharmaceutically-enhanced engineering technique to get really perfect [if we must, we must. (one of the most wonderful things about ‘legalizing it’ is all the new jokes we can make, about seemingly everything and anything – like about, in this case, speaker setup! 🙂 )]. So, although Kevin was beer-driven, we tried to setup the speakers with the limited skill sets of the sober. A lot of 1…2…3…. to move each speaker a quarter inch [the feet on the Atlas speakers are not spikes the way we have them setup, but still not easy to move on carpet either]. After maybe a half-dozen attempts at this a light from heaven shown down on my listening position. Which is to say the sound took a leap for the better. Neli and Kevin were sitting closer, on the sofa, and I was sitting behind it in a chair. Took awhile to figure out that they weren’t hearing it as good as I was. We eventually played with the position some more to get the sound more optimized for their listening position. [instead of just moving the couch back! Might as well been 420’d given the poor quality of our decision making that night. Doh!]. But I did get about two hours of listening to these speakers in what was one of those extremely rare optimally-setup-speaker anomalies. This held me quite spell-bound and, although I tried to understand it the best I could, and to compare it to past ‘magical’ listening experiences, I fear I am not going to do a very well-reasoned decomposition of what was happening. Was this particular experience unique to Acapella speakers? To horn speakers? Or can it happen with many speakers? Don’t know but I have my suspicions that it is limited to very good horn speakers. It was like listening to music in a sound-pressurized room [which was not the case here, our room is open to the dining room / kitchen] combined with an intimate head-phone ‘voice right next to me’ experience [but without the artificiality of the headphone experience]. It was like the soundstage and imaging were irrelevant. All that ‘where is this and that particular sound coming from; where between the speakers? How far in front/behind the speakers? etc. [I know 100% Audio Note systems CAN be like this – though the experience this night was more startling. 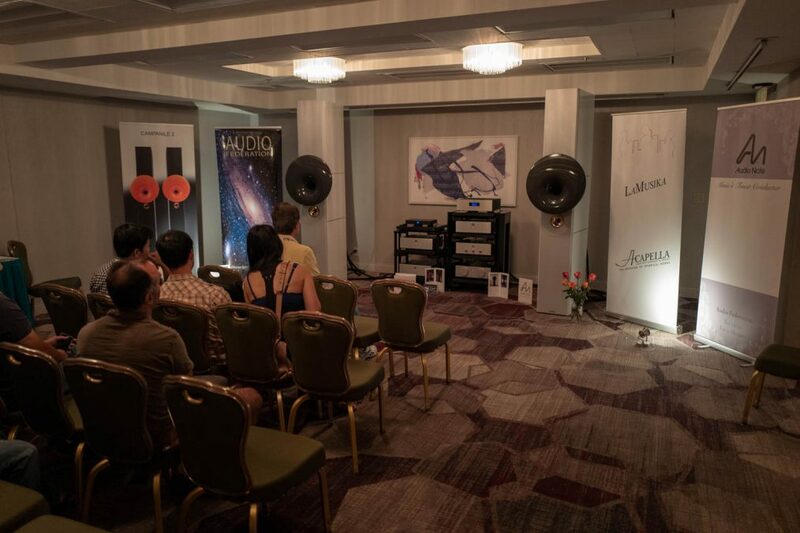 There was absolutely no pretense at an audiophilia experience here – just plain ‘experience’]. The soundwave collapsed in such a way that it provided a unified view of itself. Vocals were speaking directly, intimately, to me, Michael, not coming from across the room in a detached, impersonal yet well-reproduced manner [this is an effect I had noticed with the Acapella Triolons a way long time ago – but the effect this night was more intense]. It wasn’t head-in-a-vise, though it obviously did not extend to 3-feet in front of me and about a foot below to Neli and Kevin. It was quite nice to just sit there and as they switched CDs I just could sit and listen, and as they forgot to change CDs I could just sit and listen. It was all very absorbing. Anyway, we moved the speakers and lost the magic. Way better than when we started – and it was better for Kevin and Neli after the last move – but not the magic. 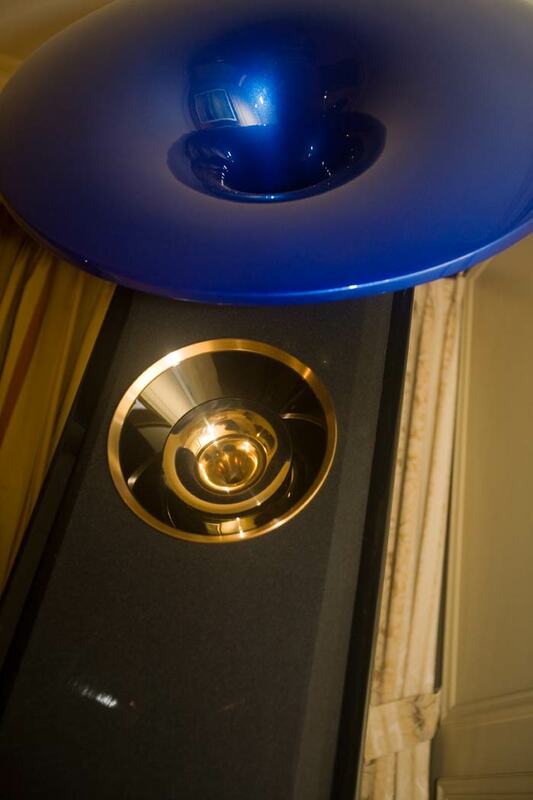 So was it as good an experience as that with the Marten Coltrane Supreme speakers?